Heat oven to 350°F. Grease bottom only of 13x9-inch pan with shortening or cooking spray. In large bowl, mix Brownie Base ingredients until well blended. Spread in pan. Bake 20 minutes. Meanwhile, in large bowl, beat cream cheese with electric mixer on medium speed until smooth. Add sugar; beat until blended. Add 2 eggs and vanilla; beat just until blended. In medium bowl, stir together chocolate chip cookie mix and flour. Add softened butter and 1 egg; stir until soft dough forms. Spread cheesecake layer mixture over hot brownie base. 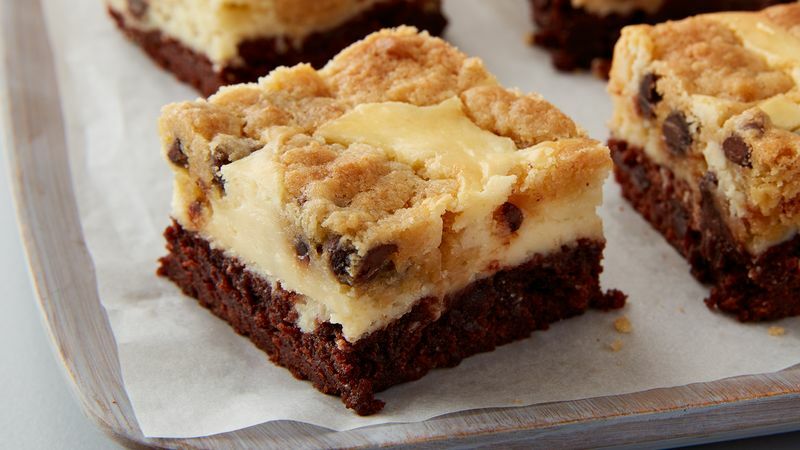 Drop teaspoonfuls of chocolate chip cookie dough over cheesecake layer. Bake 35 to 40 minutes or until cookie is golden brown. Cool 1 hour. Refrigerate at least 3 hours before cutting and serving. Cut into 6 rows by 5 rows. Store covered in refrigerator.